Beyonce's younger sister, Solange Knowles, is not afraid to take chances when it comes to beauty. 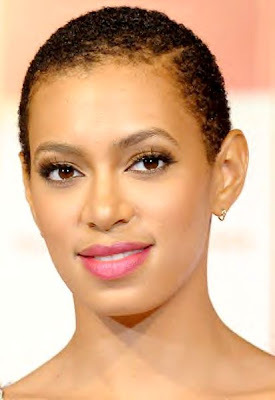 And we applaud Solange for the new ultra pixie do she got this summer. You can really see the attractiveness of her features with this bold hair style. And Solange Knowles has another beauty tip. And this one's a Best Beauty Buy for Cheap!! When it comes to lip gloss, Solange looks for a bargain and a product that delivers a pretty pucker. "Wet 'n Wild...the cheap 99 cent stuff. The lip gloss is amazing," she says. Well, we couldn't find a Wet 'n Wild lip gloss for 99 cents. There are lip liners for that low price. But the company's large variety of glosses start at $1.99 for their MegaSlicks lips. And the prices go up to about $3.59 for Wet 'n Wild's more costly glosses. Still, excellent cost-savings for women looking for a bargain and good makeup products. So, thank you, Solange Knowles for your great Best Beauty Buy.